Digitalis grandiflora, the Large Yellow Foxglove is a biennial or perennial plant native to Southern Europe to Siberia. 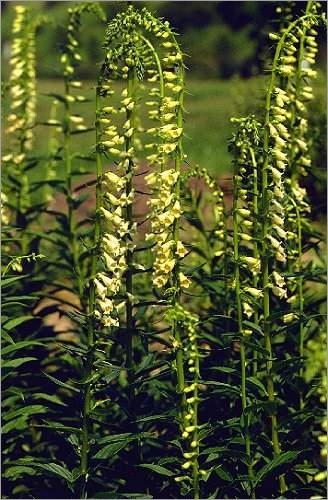 This is one of the toughest and best performers of all the foxgloves. It can reach 24" to 36" tall. 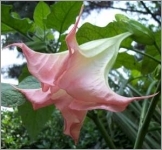 It features large 2 inch, butter-yellow bells in early Summer. The pale yellow flowers are produced on spikes that rarely exceed a meter 3 feet in height. 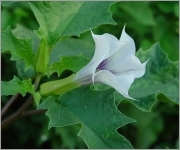 Leaves are produced in the first year and the tall spikes of flowers the second year. The leaves are smooth-textured, 7-25 x 2-6 cm, ovate-lanceolate, finely serrate and shiny above.